There was once laborer who had a daughter whom he loved very dearly. One day, when he was on his way home from his daily work, he saw a pink carnation growing beside the path. He picked it and carried it home to his daughter. She declared that it was the most beautiful carnation she had ever seen. She put it carefully into a glass of water. pink carnation began to burn immediately. At that moment there suddenly appeared a handsome youth, who said to the girl sadly: “Why don’t you speak to me? You will have to seek me among the rocks of the whole world.” Then he disappeared as mysteriously as he had appeared. There was nothing else for the girl to do except to go in search of the mysterious youth. She could no longer be happy in her own home. Accordingly she walked and walked. Finally she came to a high rock on the bank of a river and as she was exceedingly tired she sat down to rest. It was very hot and she began to cry because of her great weariness and the intense heat. Suddenly the rock opened and the handsome youth stepped out. “Why are you crying?” he asked gently. The girl was so frightened that she could not say a word. She just kept on crying. The handsome youth went on, “Over there through the forest you will see a large house with broad fields about it. Go to the house and hire out as a servant. They will receive you gladly there.” With these words he disappeared into the rock. 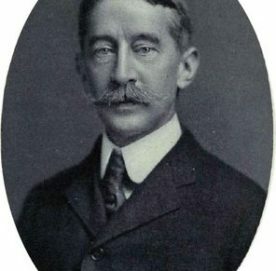 as he had directed. The mistress of the house was in need of a maid, and she hired the girl at once. face, her industrious habits, and her pleasant ways. Their mistress ordered them to tell her what it was. The mistress called the little maid to her and asked if it were true. The poor girl wept and said that it was false, that she had never said any such thing; but the other servants agreed that they all had heard her say it, and her mistress commanded her to wash all the dirty clothes in one day, according to her boast. The little maid went to the river with the dirty clothes and sat down upon the rocks to cry. Suddenly the rock opened and the handsome youth stepped forth. “Why are you crying?” he asked. The girl was so surprised that she did not answer, but went on crying harder than ever. The girl looked up in amazement, but the youth had disappeared into the rock. birds. The little maid had not known that there were so many kinds of birds in the whole world. the soiled clothes were clean and white. little maid more than ever and told all her friends what a perfect jewel of a servant she had in her employ. cure any eye trouble in the world. Of course the poor girl had never said such a thing, but all the servants agreed that she had, and her mistress became angry because her maid had known of an eyewater which she had not obtained. Accordingly, the mistress sent the girl in search of the eyewater which would restore failing sight. At once the rock opened and the handsome youth stepped out. “What is the matter? Why are you crying?” he asked. ask them to come and weep with you.” The youth disappeared. 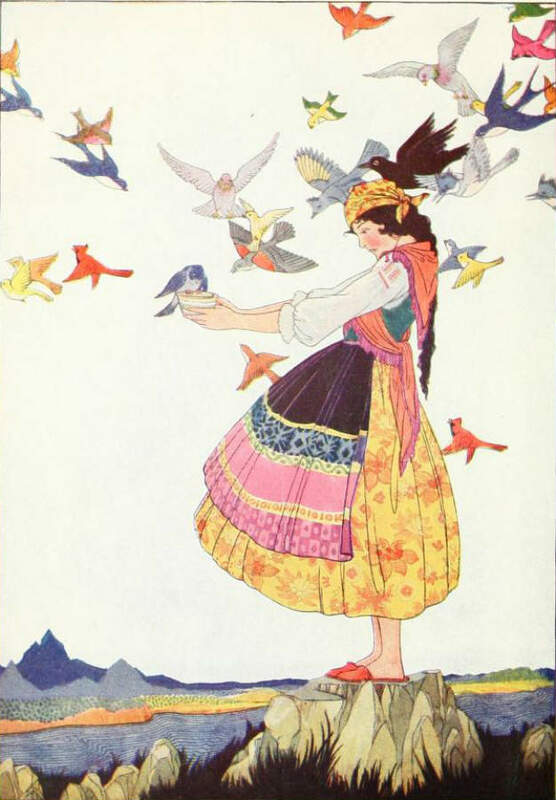 “The little maid had not known that there were so many kinds of birds in the whole world.” Illustration by Maude and Miska Petersham. Published in Tales of Enchantment from Spain by Elsie Spicer Eells (1920), Harcourt, Brace and Company. deposited a tear in the cup and soon it was full. The last bird which came dropped a tiny white feather into the cup. came better immediately. Soon she could see as well as ever, and she loved her little maid more and more. of knowing how to break the enchantment which bound the son of the house. By this time their mistress had such confidence in her maid that she believed the girl could do anything. The little maid went down to the rocks beside the river and cried as if her heart would break. The handsome youth came forth from the rock as before and asked why she was crying. the procession, and, just as she came to the rocks, the wind blew out her candle. “O, what shall I do! My candle has gone out!” she cried. She saw that the handsome youth had already appeared. “I thought I had spoiled everything when my candle went out! ” exclaimed the little maid. The young man explained to her how he had been enchanted one day when he was walking in the field. He had been changed into a carnation and had been told that his enchantment would be broken only when the person who burned the carnation should speak in his presence. The youth’s mother was the happiest woman in the town when she saw that her son was restored to her, alive and well. She kissed her little maid upon both cheeks. The little maid was entirely cured of the crying habit, and fortunate it was; for, after all the delay in getting his enchantment broken, her husband’s patience could never have endured a crying woman.